We are particularly excited and proud to include in this issue a major event in the history of modern Arabic theatre, the first Yemini play translated into English, Wajdi al-Ahdal’s A Crime on Restaurant Street, translated by Katherine Hennessey, whose work is shedding new light for Western readers on that little-known country. Yemen, in the Southwest corner of the Arabian peninsula, was one of the earliest centers of the Islamic world but entered the modern era as a region divided between the Ottoman and British empires. That division lasted until 1990, when the two regions were united in the modern Republic of Yemen, a Republic that has been seriously troubled by both internal and external military struggles since 2011. Modern theatre is considered to have been brought to Yemen in 1904 by a traveling company from India, and the first native theatre company was formed in Aden in 1910, a school group which began with a production of Julius Caesar. A real tradition of modern literary drama did not begin to develop in Yemen until the 1940s, but none of the authors of that generation gained a reputation beyond the national borders. A significant but unique exception was Ali Ahmed Bakathir, who was born in Indonesia and brought up in Yemen, where he wrote his first play in 1934. That same year he moved to Egypt, where he spent the rest of his life and where he became a significant figure in the modern Arabic theatre. Although he has been claimed as part of the Yemini theatre, then, he is generally, and more correctly classified as a contributor to the modern Egyptian stage. Several of Bakathir’s works are available in English. Ta-Ha Publishers, a small house in London devoted to Middle Eastern work, published his play, The Orchard Keeper, in a 1995 collection of three short moral Islamic moral plays for children. His 1949, The Tragedy of Oedipus, appeared in a 2005 collection, The Arab Oedipus, published by the Martin E. Segal Theatre Center in New York, and in 2014 his two plays, The Secret of Shahrazad (1952) and Harut and Marut (1962), were translated by Mohamed Abu Bakr Hamid as part of a doctoral dissertation at the University of Illinois at Urbana-Champagne. Welcome as these Bakathir translations are, they cannot really be claimed as products of the Yemeni theatre, since all were created in Egypt and are very strongly informed by the Egyptian literary theatrical tradition. A Crime on Restaurant Street is something else entirely – a play by a native still active Yemeni playwright, set in and offering a window upon current life in that country. It thus offers to English readers not only a new voice from the Arabic theatre world but a hitherto unavailable theatre tradition from that world. Available in Arabic in al-Jadid, Issue 17 (June 2016), p. 144 (http://aljadeedmagazine.com/?id=1497). Yemeni actor ‘Abd al-‘Aziz al-Ba‘dani (Wiswas). Photo credit: Benjamin Wiacek. Proper names in this text are transliterated with diacritical markings the first time that they appear, and subsequently are written without diacriticals. Coffeehouse, stage right. A bench, stage left. At the edge of the stage quite close to the front row, a white Western-style toilet. In the background, entrances to restaurants, decorated with banners showing pictures of appetizing plates of food and the name of each establishment—‘The Modern Restaurant,’ ‘Nūr Restaurant for Traditional Dishes,’ ‘The ‘Assīd Restaurant,’ ‘The Eastern Restaurant’. Hanging from the ceiling, an enormous golden ball on a gold chain, which constantly swings from back and forth. The ball is labeled ‘The Bank’ and displays a US dollar sign. As the curtain rises we hear a piercing metallic noise, that of the golden ball swinging on its chain. Three men are sitting in the coffeehouse, speaking in loud but garbled voices. Hurayb the waiter enters. He is slender as a reed, and holds in his hand a silver tray with three small glasses, which he sets in front of the three customers. Next to enter is Murshid, a grey-haired man wearing a thawb and a suit jacket, his head wrapped in a Yemeni-style turban. He leans on a cane. We hear him recite a blessing and a prayer  before he greets the three men. The three men (together): And upon you peace, and God’s mercy and blessings. Murshid sits during this exchange. Hurayb (raises his voice): Tea for Professor Murshid! Murshid (strokes his beard): Tell him no sugar. Murshid: And it would be better if it didn’t have tea. Hurayb (calls): Tea with no tea! An elegantly dressed man enters wearing a brown suit, a red tie, a white shirt, and a brown skullcap. Head held high, he strides briskly and confidently towards the bench, where he sits with one leg crossed over the other. Hurayb (notes the presence of the elegant stranger out of the corner of his eye, then chants, lingering on each syllable) And one tea with milk, extra sweet. Hurayb exits to collect the orders as a pretty young woman, not yet twenty, enters. Her dress is marked and stained, its colors faded from much washing. She has come to the coffeeshop to beg. The first customer hands her a coin. Jamila: God bless you… may God reward you for what you’ve given me. She turns to the second, who hands her a fifty riyal note. Jamila (raises her hands in prayer): May God bless you and open the gates of heaven to you… may God grant you an unending stream of blessings! She then turns to Yasir, who looks through all his pockets but finds nothing. Murshid (sarcastically): Forgive him, dear child, he’s a journalist and belongs to the jinn. No doubt he’s hiding his money in his finance section (pokes Yasir in the ribs). Jamila: (retreats from Yasir, embarrassed): Thank you—I wouldn’t want to distract him from his service to his devoted readers. Murshid: Tell me, friends, what’s the latest from the stock market? What has the price of gold gone up to? Hurayb the waiter enters, carrying two cups spattered with drops of green paint. He places one, with black tea in it, in front of Murshid. He then heads towards the bench and leaves the second—tea with milk—next to the elegant man, and exits. Having heard Murshid ask about the price of gold, Jamila assumes he’s rich, and so approaches and extends her hand to him. Jamila: Sir—may God grant you long life—please help me, just a little. I have to support my younger brothers and sisters. Murshid: Let me explain something, my dear. I am a man of culture and education. Do you know the meaning of the word ‘cultured’? Jamila: (entwines her fingers, as though in front of a schoolteacher) No sir. Murshid: A man of culture does not give alms, because he wishes to discourage a system of dependence on others. You would like to depend on me, but that is an abominable error, one that I cannot accept. Yet that does not mean I will give you nothing. On the contrary—I can give you the most important thing in the world, something more precious than money: science and knowledge. Ask me any question and I’ll give you the answer. For free, in God’s name. Jamila: (finally unclasping her hands) Yes sir. Murshid: (with mild irritation) Call me ‘professor’, child—‘professor’. Jamila: Yes, professor. Please tell me (pointing)—what is that yellow ball suspended in the air? Murshid: First, that is not a yellow ball, but rather a golden one. Second, that golden ball is called The Bank. Jamila: And what’s inside it? Murshid: Money. All the money in the world—this world and the next! Jamila: Ah! In that case I can stop begging—I’ll just go over there and stand beneath it and wait for the money to rain down on me! Jamila picks up a brass bowl, rushes over to the space below the yellow ball, lifts the bowl over her head and waits for money to fall out of it. The ball continues to swing back and forth and she races around a small area of the stage, attempting to stay directly underneath it. We hear an echoing voice, husky like the mooing of a cow. Voice of the Bank Manager: Wiswas! Wiswas… Wiswas! Wiswas enters, dressed in a pinstriped suit and a bright pink tie, carrying a black briefcase. He stands still, directing his speech at the yellow ball. Wiswas: Yes, sir, at your service. Voice of the Bank Manager: Who is that, sitting proud and haughty on the bench there? Lights go out across the stage, with the exception of one spotlight focused on the elegantly-dressed man on the bench. Wiswas: That’s ‘Abd al-Latif Muhammad Ahmad, the interior designer. Voice of the Bank Manager: (his tone changes, becomes more delicate) Ah… an artist! Wiswas: Yes sir, he is an artist. Voice of the Bank Manager: How lovely to find an artist on Restaurant Street. Wiswas: On Restaurant Street you find all kinds, sir. Voice of the Bank Manager: Truly, Wiswas, you are a sage. And who is this? The spotlight shifts from the interior decorator to the journalist, who is listening attentively to the conversations taking place at the table. Wiswas: It’s Yasir ‘Uthman. A journalist. Voice of the Bank Manager: (hums) And this one? The spotlight shifts to Murshid, who expounds upon something, though we do not hear his words. Wiswas: Murshid Antar. An intellectual. Voice of the Bank Manager: And who is this fool racing about beneath me? The spotlight shifts to Jamila. Wiswas: That’s Jamila. They say she’s been begging in Restaurant Street since she was born. The spotlight moves to the yellow ball. Voice of the Bank Manager: And I, my dear Wiswas… do you know who I am? Wiswas: (confused) Um… You’re the Bank Manager, sir. Voice of the Bank Manager: And what else am I? Wiswas: (wiping sweat from his forehead) Um… oh God, I don’t know! Voice of the Bank Manager: Speak! Do you not see that this street boasts a journalist, an intellectual, and an artist? It lacks only one thing—a scientist! Wiswas: (smiles, but fearfully) Ah yes, sir, now I understand. You’re the scientist. The inventor. Voice of the Bank Manager: Well done, Wiswas. It’s true that I have invented a scientific theory, one of great importance to humanity. And I want to apply it first to that artist. Wiswas: Why the artist, in particular? Voice of the Bank Manager: Because an artist is one of the finest elements of society. Voice of the Bank Manager: I want you to help me apply this scientific theory, Wiswas. Go over to the intellectual and tell him to come here and tell me everything, major or minor, that he knows about the artist. To kick-start his tongue, offer him twenty thousand riyals in advance, and an equal sum when he departs from us. Wiswas: At your command, sir. The lights come back on. Wiswas walks over to the coffee shop, selects a chair next to Murshid and sits down. Tired of racing back and forth beneath the yellow ball, Jamila sinks to her knees and wipes her forehead with her sleeve, then stands and walks listlessly to the bench, where she sits, holding the empty brass bowl. ‘Abd al-Latif: Why have you tired yourself out running after that ball? Jamila: They told me it was stuffed with money. So I thought, maybe if I stood beneath it I’d get something from it. ‘Abd al-Latif: (laughs) Whoever told you that is an idiot. Didn’t you notice that it’s inflated? ‘Abd al-Latif: It’s inflated with air, not money. Jamila: (tosses the bowl away) You’re right. They tricked me. Thank you for saving me from chasing that ugly ball! ‘Abd al-Latif: (smokes a cigarette) I’m just about to order breakfast. Would you care to join me? Jamila: (looks down at her ragged dress) Are you sure you want to be seen eating with me? ‘Abd al-Latif: Why would you say that, Jamila? All people are equal. You should never think of yourself as lower or less valuable than anyone else. Jamila: (smiles) Good. In that case, I will have breakfast with you. ‘Abd al-Latif: (raising his voice) Hurayb! Two plates of fasuliya. ‘Abd al-Latif and Jamila continue their conversation, inaudibly. Wiswas: (addresses Murshid) What did you say, Professor Murshid? Do you agree to give us a statement? Wiswas pulls a wad of money from his bag and thrusts it into Murshid’s coat pocket. Wiswas: Take this as the first installment; when you return you’ll get another twenty thousand riyals. And now let’s go to the bank. Wiswas and Murshid head towards the front of the stage. Wiswas: (raises the toilet lid) Please do sit down, Professor Murshid. Murshid: (sits on the toilet, facing the audience, glancing around awkwardly) Thank you. Wiswas: Wait here until the Bank Manager is finished with his work (exits). Hurayb enters singing a song by ‘Ayūb Ṭārish and carrying a dish of fasuliya in one hand, a basket of bread in the other. He places the basket and the dish on the bench and then he finishes the song, singing softly. ‘Abd al-Latif and Jamila eat and laugh happily. Voice of the Bank Manager: Ahem! Are you prepared to speak with me? Murshid: (looks in all directions, searching for the source of the sound) Yes. Voice of the Bank Manager: Are you an educated man? Murshid: (notices the yellow ball, stands up and walks towards it as though stalking prey, his gaze fixed) I am. You won’t find a better-educated man in this entire country. Voice of the Bank Manager: Is it true that you’ve accepted bribes from people in high places, to turn a blind eye to their misdeeds? Murshid: That’s a lie! My enemies—Zionists—CIA agents—they’re the ones who spread these slanders! Voice of the Bank Manager: Do you know ‘Abd al-Latif Mohammed Ahmed? Murshid: ‘Abd al-Latif? … ‘Abd al-Latif … Oh, him. Yes, I know him. Voice of the Bank Manager: Excellent. I want you to tell me everything you know about him. Murshid: Why? Are the two of you related somehow? Voice of the Bank Manager: (sharply) That is none of your business. Answer the question I’ve asked you, and don’t pose questions of your own. Murshid: (bows his head) Of course. Throughout the next speech Murshid will make an uncommon physical effort to match his facial expressions and gestures to the meaning of the words he utters. This will be accompanied by appropriate music. Murshid: (his voice breaks, and he makes an effort to collect himself) Well, I know that he’s an employee at one of the ministries—no, that’s not right. We’re not friends, you see—it’s just that at the café, as you know, you find everyone from men to jinn. And you can find him there every day, drinking his tea with milk. His Highness arrives in the early morning, and remains in Restaurant Street grazing here and there like a little lost billy goat until ten at night, when the shops close. He eats three or four pieces of khamīr  and drinks a cup of tea with milk for breakfast. He eats lunch late, after the kitchens close, slinking off to a restaurant owned by one of his acquaintances, someone from his hometown, and eats whatever’s left. How he manages to dupe anyone into giving him dinner I don’t know, because I return home before nightfall. They say he’s an interior designer, but I personally think he’s like a giant octopus who’s crept into our world unnoticed, out of a drain whose pipes run to the sea. He seems to have studied abroad—he’s likely one of those sad souls who try to ape foreign ways in whatever country it is where they study, impressed by the freedom they feel it offers. Then when they return to Yemen they can’t re-acclimatize to their own society and its customs and traditions. It’s like they’re suspended in mid-air, torn up from their roots, unable to integrate, as though a delicate veil separates them from everything around them. They have an exaggerated sense of their own importance, and condescend to others, and shake their heads loftily…They harbor delusions of grandeur, and lay claim to ‘romantic melancholy’ when in fact they’re merely sullen and intransigent. And there he sits in the café like he’s some genius, the center of everyone’s attention, and he imagines he’s famous and celebrated, too good to speak to the lowly plebians. He deludes himself into thinking he’s a celebrity, going to great lengths to conceal his identity—as though he’s keeping legions of fans at bay! Mimicking the world’s most famous people in his practiced gestures and his favorite poses! His Lordship comes out in the morning and perhaps drinks some cheap local wine, and then you see him sitting at the café, cushioned by a government newspaper, since he wouldn’t want to dirty the immaculate seat of his pants… As the day wears on he gradually rouses himself from his stupor… yes… he regularly insults the government, starting the day with fiery invective and continuing for hours in the same vitriolic vein, moody, aggressive, convinced that everyone is out to get him. He dreams, he fantasizes that he’s oh-so-important, and he interacts with people on those terms. So he won’t reply to greetings, or respond to those who address him—he grants himself a privilege normally reserved for royalty, that is, not deigning to speak with those of lower stature. He walks with his head high, staring up at the clouds, and only rarely lowers his gaze from the heavens to chat with some acquaintance of his. He doesn’t laugh or smile—he furrows his brow, his face sullen, his eyes broadcasting grumpiness to everyone who sees him. He wraps himself in mystery, in an aura of counterfeit gravitas, so that he can refrain from speaking; his features remain stony, his voice low, his speech intense, as though he’s hiding something dangerous, that he doesn’t want spies to pry out of him. He accords himself an inflated importance, based on his subconscious delusions. He never takes off his sunglasses, and behind them his eyes dart back and forth, ceaselessly monitoring his companions’ movements, marking which of them listen to his words—all of which just goes to show how great an interest he takes in himself! Once I saw him infiltrate a large group of petitioners gathered around a minister, and stand right in front of him, tall and strong, head erect with his nose almost touching the minister’s, as though he was one of the elite. The minister, impressed, assumed he was head of a big conglomerate, and agreed to hear his request. It seems that he asked the minister for financial assistance, and the minister agreed to a reasonable amount, at which the artist began a fierce argument. He lost his temper and raised his voice to the minister, who began to shout as well, until the minister’s bodyguards intervened, and removed him from the scene, using undue force. So he left, muttering. After that his moodiness increased, and his body developed nervous tics… The last time I saw him? It was today in the café, around three hours ago. He was wearing a striped suit—very ugly, and when you see it up close you realize it hasn’t been pressed. I remember that when he saw me approaching the café he stopped and walked towards me like he wanted to pick a fight with me. He collided with me, hitting me hard in the shoulder, as though he wanted to intimidate me—as though brawling with me would dispel his psychological problems. But I ignored him, and continued on my way as though he weren’t even there. (notes that the yellow ball has stopped moving) Is that enough? Voice of the Bank Manager: Yes. Go to the counter to receive the rest of your fee. Murshid: Thank you (runs out). Voice of the Bank Manager: After only two days had passed, I felt I needed someone else to provide a statement regarding ‘Abd al-Latif Muhammad Ahmad. And that girl came to mind. The beggar—I believe her name is Jamila. So I commissioned my agent Wiswas to arrange the matter. A spotlight frames Jamila, who recounts her tale while dancing to the sound of short pieces of music. Her dress suits her movement. She speaks in a calm tone, without a trace of emotion. Every morning I stand on the corner of Restaurant Street and beg from the passers-by, while he sits in his favorite spot, on a clean piece of cardboard. And when the sun gets too strong, he hands me his sunglasses and teases me by blowing me kisses and speaking to me so sweetly it makes my head spin—no one else on earth has ever spoken to me like that. I am seventeen years old and I often imagine myself as his wife, and lose myself in daydreams about what a happy life we’d have together. I’m so passionate about him I’ve learned all of his habits by heart, and his favorite dishes, and his brand of cigarettes, and I know everything he likes and dislikes, everything that troubles him—his own mother might not even know him as well as I do! His favorite breakfast is fūl with minced meat, and he always orders a bowl of it from a little out-of-the-way place at the end of Restaurant Street, on the side that’s blocked by the concrete wall. He eats his lunch, a rich salta, at a neighboring restaurant. But I don’t know what he eats for dinner. My older brother always drives me home at least an hour before sunset—that’s because one time I was late, and in the dark a gang of street kids attacked me and stole everything I’d earned that day. And when I got home, I was beaten black and blue for not bringing any money back. He’s not yet fifty years old, medium height, and he weighs exactly what he should for his height. His skin is brown and tanned from the sun, and he shaves his beard and mustache. His eyes are small and deep-set, his hair black, with no gray in it… No… no, I don’t think he dyes his hair… He wears chestnut-colored sunglasses, which give him a solemn look that people revere. He likes to be seen in a suit—in fact I’ve never seen him dressed informally, not even once over the course of years! You’ll never see him wearing a shirt by itself without a jacket, and he never wears a thawb or a ma’zar. He prefers his suit to be gray, or various shades of green, with a gold or a red tie. There’s only one thing that detracts from his elegant appearance: he sometimes wears flip-flops,  which don’t go with a suit, but most often he wears dress shoes. What I find most attractive is that he’s always wearing hats, in wonderful colors—they make him look like the great artist he is. He’s very modest, though he’s wise and cultured as a philosopher. Once I heard him speaking with some children, and he said, ‘When the Earth ceases to spin madly around her axis, then people will relax, and stop racing after their daily bread.” I remember back when the war between Lebanon and Israel broke out, he was always up early, unshaven, his face twisted and dark, his transistor radio glued to his ear, the antenna stretched to its fullest. He followed the news of the war on Lebanon constantly, as though he was a Lebanese citizen living in Yemen! During those days he completely forgot about me and spent entire days just listening to the news, pacing back and forth like a caged wolf. Oh, how I love the way he walks! His stride is distinct from all other men’s. Supple, with even steps. There’s music in it. A dancing rhythm. And his head sways in sync with his body, as though he’s walking not just with his feet but with his whole self…. It’s a self-confident walk, like the movement of a haughty lion! Once he handed me a green leaf—I don’t know what kind of tree it came from—and asked me to look at it closely and tell him what it resembled. So I set my mind to it at full steam, and thought and thought about what it looked like, but couldn’t come up an answer. He let me think and went to drink some ‘Adeni tea, sipping it slowly, and occasionally glancing over at me. And I thought I’ll tell him the leaf looks like the human heart. I was so relieved to have come up with a response that I beamed with joy, in part because I thought it was an answer that would bring us closer together. When he finished his glass of tea, he stood up and threw me a knowing glance—he could guess from my smile that I’d figured out the answer. He walked over to me and signaled with his hand that I should tell him. But when he heard my words, he raised his eyebrows and rubbed his nose, and told me I was wrong. So I asked, ‘Then what’s the correct answer?” And he took my hand and pointed at me with his index finger, saying, “This leaf is just like your dreams about men!” Then he walked off, laughing a deep, hearty laugh. And I felt my whole body tingle—I almost fainted from the shock and embarrassment he’d caused me. (sighs) What an enchanting man! Voice of the Bank Manager: After no more than a week, I felt a murderous desire to know more of ‘Abd al-Latif Muhammad Ahmad. I decided to extract the information I wanted from the mouth of ’Abd al-Latif himself, but indirectly—so Wiswas, following my orders, paid a respectable sum to that fool the journalist, the one who wastes all his time in the coffeehouses, to conduct an interview with ‘Abd al-Latif. Spotlight on Yasir, who holds a voice recorder in his hand, and ‘Abd al-Latif, who stands next to him. Yasir: Today, dear readers, we shine a spotlight on one of our beloved nation’s greatest designers, Engineer ‘Abd al-Latif Muhammad Ahmad, who has kindly agreed to tell us about himself. Holds the recorder to ‘Abd al-Latif’s mouth. All stage lights on. Spirits dressed in green flutter around ‘Abd al-Latif in a dance. ‘Abd al-Latif: (moves around the stage while Yasir follows, trying to catch his words with the recorder) My name is ’Abd al-Latif Muhammad Ahmad. I was born in 1958, but my parents died early, and I grew up in my grandfather ‘s house. When I was ten my uncle took me with him to Kenya, but he died suddenly just a few months later, and his wife cast me out into the streets. It was my good fortune that a Lebanese Maronite family adopted me—they treated me like one of their own sons. There I learned what life can be—they gave me an upbringing that was refined beyond anything you can imagine. They compensated for what I had missed in my education—I studied in French schools, I learned to paint and dance and play the piano, and I mastered French, English and Spanish. We would spend our summer vacations in Beirut. Then, after the civil war erupted in 1975, we spent our summers in Europe, a different country each year. The wealth of my Lebanese family meant that I could travel the world. I’ve crossed the Atlantic ten times, and meandered through North and South America country by country. I know Chile and the streets of Santiago like the back of my hand, because I lived there for two and a half years with my aunt, my adopted Lebanese father’s sister. I tried studying structural engineering, but I didn’t like it, so I left Santiago and headed to Paris to study interior design. I spent seventeen years with my Lebanese family, and through them I tasted all the pleasures the world offers, and all of its joys. Money ran through my hands like a rushing waterfall. (The spirits stop dancing and freeze in place) When my adoptive father died, my Lebanese family decided to immigrate permanently to Europe; I left them, and went to work as a contractor. I quickly made a name for myself, and earned quite a lot of money. I married twice. My first wife was French, a gorgeous woman from the city of Nice, but I only stayed with her for a year. My second wife was born in Kenya—she lived with me for three years, but then I divorced her, and neither marriage was blessed with children. Then fate intervened in a way I hadn’t counted on—I was arrested and thrown in jail, then deported from Kenya, and in the blink of an eye I found myself back here. That was in the early nineties. I didn’t despair, and tried to rise again from the ground where I’d fallen. I invested the money I’d earned as a contractor in Kenya, and was able to win the most important tender that the bank had announced at that time. But conditions were adverse, and during that period I burned out. (The spirits in green exit, as though fleeing in fear) I had around eight hundred thousand dollars in the bank, and suddenly I wasn’t able to withdraw any of the money. My psychological state worsened when the civil war exploded in 1994. That shattered my already brittle nerves, and I developed a disease that affects the cells—a rare, malignant disease that scientists know almost nothing about. When I came down with it, my brain cells began to send vibrations into space, carrying all of my thoughts along with them. And there’s a machine, an apparatus that collects my thoughts, and that’s how they spy on me and obstruct everything I want to accomplish. And then they direct their own evil thoughts into my brain cells. They’re trying to destroy me, to turn me into a criminal who’ll do their dirty work. And they’ve targeted me because I refuse to serve them, refuse to carry out their orders. They just want to be rid of me, and they don’t care how. I’ve suffered from this condition, this disease, for seventeen years. They’ve cut me off from every decent livelihood, and they fight against me everywhere I go to find work. Even when customers ask me to be their designer, an agent of theirs always comes to warn them against working with me, telling them that I’m mentally unstable. But despite all of that, I’m still in control of myself, and my strength of mind. I have my situation under control. They’re scum, the putrefying waste of the universe. I defy you to find one of them who has earned his money by the sweat of his brow. I defy you to find one of them who has lived honorably. Certainly I’m not the only one in this country who has had his financial rights taken away—and I’m not speak about my personal problems, I’m talking about a problem that everyone suffers from. Every one of these poor people who you see wandering here—they’ve all been robbed of their financial rights. Isn’t each of these beggars, who we see slowly suffocating in their poverty, the rightful owner of a share in the oil revenue? My problem is that I’m burdened with everyone’s worries, not just my own. And that’s how they keep me from sleeping—they broadcast their messages into my cells all night. I’m lucky if I sleep one night a week. Journalist turns his back to the audience. Total blackout. Curtain. ‘Abd al-Latif sits alone in the cafe, sipping milk tea from a glass cup speckled with green paint. Wiswas enters carrying a black briefcase, and sits next to him. Wiswas: Waiter! (calls to Hurayb) One milk tea. (addresses ‘Abd al-Latif, with a broad smile) Are you ‘Abd al-Latif Muhammad Ahmad? ‘Abd al-Latif: (looks at him for an extended period in silence) Yes. How can I be of service? Wiswas: (takes a newspaper out of his bag, spreads it out and points to one of the pages) I read the interview the journalist conducted with you—they gave it a full page, because it was such a great interview. ‘Abd al-Latif: I thank you. Wiswas: It’s quite an honor to meet you in person. I am an agent of the bank. ‘Abd al-Latif: (visibly surprised) What? Wiswas: And I have good news for you. The bank manager has read your interview as well, and has decided to solve the problem of your financial rights vis-à-vis the bank. ‘Abd al-Latif looks Wiswas up and down with contempt, picks up his glass and walks a few steps away as though wishing to leave the coffeeshop. Hurayb enters, carrying the glass of milk tea. Wiswas jumps up and blocks ‘Abd al-Latif’s path, offering him a gold business card. Wiswas: One moment, if you please, Mr. ‘Abd al-Latif. Take one of my business cards, which demonstrate my official status as an agent of the Bank. Hurayb follows Wiswas, trying to find an opportune moment to hand him the cup of milk tea. ‘Abd al-Latif: (scrutinizes the card and then returns it to its owner. Speaks in a hoarse, menacing voice) And when exactly will I receive the money the bank has taken from me? Wiswas: You will receive your money after you fulfill one condition. Wiswas turns around, notices Hurayb behind him. Pays him and signals that he should leave. Hurayb lingers, obviously eavesdropping. Wiswas: We require that you commit a crime. A single crime. Become a terrorist, and then you can come to the bank and take your eight hundred thousand dollars. ‘Abd al-Latif: What kind of talk is that? Are you in your right mind? Or are you insane? Wiswas pulls a black envelope from his briefcase, empties it of its contents and displays them. Wiswas: Look at this, Mr. ‘Abd al-Latif. This is a check for eight hundred thousand dollars, to be paid to the bearer. It will be delivered to you upon your fulfillment of our condition. And on this blue paper is a list of seventeen crimes, devised by our side. You must choose one of them. ‘Abd al-Latif removes his sunglasses and stares at the blue paper as though concentrating his entire soul. He reads, hiding the list from view, as a number of the café’s customers and Jamila gather around the two men. ‘Abd al-Latif’s face changes suddenly, as if someone has poured boiling oil on him; his face flushes with anger, his entire body trembles with a nervous convulsion born of intense fury. Wiswas blanches in fear when ‘Abd al-Latif raises himself to his full height, tears the blue paper into tiny pieces and throws them in his face. ‘Abd al-Latif: (yells wildly) You want to turn me into a terrorist. May God curse you and all the banks in the world! Customers and Jamila show their solidarity with ‘Abd al-Latif, with throaty cries of disapproval and indignation. In an instant, Restaurant Street morphs into a volcano, rumbling with rage. Wiswas flees with swift, zigzagging steps, holding the briefcase up to protect his face. He heads for the toilet and sits on it, weeping. Voice of the Bank Manager: What is this world coming to? How dare they insult my representative? Has this rabble lost their minds? I swear I’ll be revenged! Sound of thunder and stormy winds; stage lights flash like lightning. Wiswas and customers exit. Thunderstorm subsides, lights come up on stage. ‘Abd al-Latif sits alone at a café table, a cup of milk tea in front of him, a radio in his hands. He moves the dial, searching for a station. Wiswas enters, disguised as a crazy man; he babbles incomprehensibly and his nervous gestures, twitches and tics suggest he has lost his mind. ‘Abd al-Latif observes him for a while, then returns to the radio. Suddenly Wiswas approaches ‘Abd al-Latif’s table, snatches his cup and throws its contents in ‘Abd al-Latif’s face. ‘Abd al-Latif: (jumps up, wiping the hot milk tea from his face) You animal! Wiswas laughs. ‘Abd al-Latif attacks Wiswas and strikes him with all his might. Sound of a police siren. Two policemen enter and arrest ‘Abd al-Latif. Wiswas sneaks behind them and pours a vial of red bloodlike liquid on his head. Wiswas: Help! Help! This criminal has broken my skull… Oooowww! The policemen drag ‘Abd al-Latif offstage. Wiswas stretches out on the ground, pretending to be dead. Police siren gradually decreases in volume, suggesting the police car is driving away. Musical interlude. The café bench is replaced by the iron bars of ‘Abd al-Latif’s jail cell. Stage lights come up, showing ‘Abd al-Latif, who paces within his cell like a captive lion. Prison has taken its toll: his back is hunched, his hair has turned gray, and he has grown a beard. Wiswas enters, carrying his black briefcase, and slinks over to the cell. Wiswas: How are you finding prison, ‘Abd al-Latif? (‘Abd al-Latif does not respond) You look quite different after spending seventeen months in the same cell with murderers and thieves and rapists, you know. You’re skin and bones, you’ve gone gray, your back is curved like an old man’s. You’ve aged twenty years in a few short months, and the specter of death hovers in your eyes. You stubborn little insect! (clutches the end of his pink tie and uses it to fan himself) By the way, we’ve burned your file. And that means you have two options. First, we can have you released, with a simple phone call. Second, we can keep you locked up here to the end of your days—because in the eyes of the law, you are a criminal without a crime. A minute passes; ‘Abd al-Latif and Wiswas remain silent, as though performing a mourning ritual for the dead. ‘Abd al-Latif : (wakes from his trance and speaks at last) Someday the truth will come out. Wiswas: (laughs so hard he hacks up mucus) The truth! You’re so naïve! Truth, my friend, is only worth what you can pay for it. And since we’re the ones with the money, we can purchase whatever truth we want! What you need to understand is that truth is directly connected to our wallets. And since your wallet is empty, and mine is full, that means the truth isn’t in your wallet. It’s in mine. ‘Abd al-Latif: (slowly) I want to know… what crime have I ever committed against your manager? Wiswas: Your crime is that you haven’t committed any crimes at all! ‘Abd al-Latif: Why is your manager trying so hard to turn me into a terrorist? Wiswas: He’s obsessed with taking what’s rightfully yours—taking your eight hundred thousand dollars. But conditionally, to test your merits. ‘Abd al-Latif: What merits? Would you call staining my hands with the blood of innocent people ‘merits’?!? Wiswas: The Bank Manager is a philosopher, and quite a unique one. He’s invented a new theory of ethics, you see, and you are one of the examples that make the theory work. Wiswas: Yes. According to this theory, people will engage in criminal behavior if this is the only way to attain what they deserve, materially and spiritually, within society—like predators in the jungle. And the axiomatic reward for committing such crimes is being considered an upstanding citizen. ‘Abd al-Latif: So… that means that the best citizen is the biggest criminal? ‘Abd al-Latif: And what if a person rejected this theory root and branch, and insisted on remaining innocent? Wiswas: In that case, such a person would be considered a bad citizen, and classified as a criminal who has committed the worst crime against society. Namely, that he lacked the courage to commit any crime. ‘Abd al-Latif: The Bank Manager’s theory of ethics is quite complex. Wiswas: On the contrary, it’s remarkably simple. Once you realize that, you’ll come to see things as I do. ‘Abd al-Latif falls silent, deep in thought. ‘Abd al-Latif: (voice quaking) Do you have a cigarette? Wiswas takes a pack of cigarettes out of his pocket, takes one for himself and lights it with a lighter. Then he pulls out another one, lights it from the end of his own, and hands it to ‘Abd al-Latif through one of the holes in the iron grille. ‘Abd al-Latif inhales the smoke with voluptuous satisfaction, and sighs in rapture. ‘Abd al-Latif: Would you be so kind as to hand me the blue paper? Total blackout. Wolves howling, red and purple lights. ‘Abd al-Latif leaves his prison cell, and Wiswas hands him a Kalashnikov rifle and a mask that depicts a demon’s face. The coffeehouse customers sit at their tables; Jamila begs from them. Hurayb, sponge in hand, wipes off the tables. ‘Abd al-Latif approaches the café, raises his rifle, and opens fire on everyone. The sound of gunfire is deafening. The customers, Jamila, and Hurayb all fall to the ground, dead. Sounds of screams and weeping. ‘Abd al-Latif retreats from the scene of the crime, and goes to sit on the toilet, striking a heroic pose with his rifle. Wiswas applauds feverishly. Wajdi al-Ahdal is a celebrated Yemeni novelist and playwright. Born in the province of Hodeidah in 1973, he holds a BA from the University of Sana’a, and is the author of four novels, three collections of short fiction, two plays and two film scripts. His play The Colonel’s Wedding won first prize for scriptwriting at the 9th Arab Youth Festival in Alexandria, and his novel The Quarantine Philosopher was longlisted for the 2007 International Prize for Arabic Fiction award. In 2009 the ‘Beirut 39’ project, under the aegis of the Hay Festival of Literature (UK), named al-Ahdal one of the top 39 writers under the age of forty in the Arab world, and he spent the summer of 2012 as a Writer in Residence at Vitosha Cultural Center in Ann Arbor, Michigan (USA). In 2002 his novel Mountain Boats was condemned by the authorities and he was forced to seek refuge in Damascus. Only the intervention of Günter Grass and other leading international literary figures was he permitted to return to Yemen without threat of prosecution, although his work continues to engage with contemporary political concerns, as this play demonstrates. His work has been translated from Arabic into Italian (A Donkey Amidst the Music, trans. Francesco de Angelis as Un asino tra i suoni, Poesis 2010), French (Mountain Boats, trans. Sarah Rolfo as Barques de montagnes, Bachari 2011), and English (A Land Without Jasmine, trans. William M. Hutchins, Garnet 2012). The latter won the 2013 Banipal Prize for literary translation. Al-Ahdal originally composed the play translated here, A Crime on Restaurant Street, as a short story and then adapted it for the stage. The play premiered at the Cultural Center in Sana’a in April 2009. Katherine Hennessey is a Research Fellow with the Global Shakespeare program at the University of Warwick and Queen Mary University of London (2014-16), and a Moore Institute Visiting Fellow at the National University of Ireland, Galway (late 2016). From 2009 to 2014 she lived in Sana’a, Yemen, researching contemporary Yemeni theatre. Her writing on Yemen has appeared in numerous publications including Middle East Report, ArabLit, and Arab Stages, and the anthologies Why Yemen Matters (2014) and Arabia Incognita (2016). Hennessey is co-editor, with Margaret Litvin, of the special ‘Arab Shakespeares’ issue of Critical Survey (28.3, December 2016), and author of Shakespeare on the Arabian Peninsula, forthcoming from Palgrave’s ‘Global Shakespeares’ series. The $ sign on the ball does double duty, according to the play’s author: it is both a universally recognized symbol of money, investment, and capital, and an ‘S’ for Saleh, linking the sinister character of the Bank Manager to Ali Abdullah Saleh, president of Yemen at the time that al-Ahdal composed and Hazaber staged this play. For an analysis of this play and its courageously incendiary critique of Saleh and Yemeni politics, see Hennessey, “Staging the Revolution: The Drama of Yemen’s Arab Spring,” Arabian Humanities 4 (2015), https://cy.revues.org/2848. يحوقل ويستغفر= he recites the Islamic phrase ‘there is no power and no strength but in God’ and the supplication ‘may God forgive’. 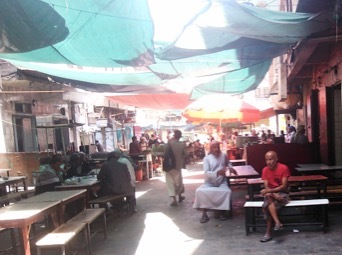 A common practice at Yemeni restaurants and coffeehouses, particularly in areas where they cluster, as on Restaurant Street: glasses are speckled with paint in a particular color to distinguish them from those belonging to neighboring establishments. The Arabic here is muhandis daykūr, or ‘an engineer of décor,’ a phrase open to a range of translations, from ‘interior decorator’ to ‘[theatrical] set designer.’ Effectively, ‘Abd al-Latif is a creator of beautiful spaces, whose successful career abroad comes to an abrupt end upon his return to Yemen. Saleh was well known for his savvy patronage politics, and his ability to play various factions of the Yemeni elite against each other using a complex nexus of threats and bribes. Celebrated Yemeni singer (b. 1942) from al-‘Abūs, in the governorate of Ta‘iz, and composer of the Yemeni national anthem. Murshid’s ‘testimony,’ like Jamila’s, which follows it, provides a distorted picture of ‘Abd al-Latif; each character’s description of him is inflected by his or her own preoccupations, needs, and desires. The stage direction here suggests both that Murshid is obviously or theatrically ‘acting out’ his testimony for the benefit of the Bank Manager and that he is intensely invested, emotionally and psychologically, in convincing his audience to believe the portrait that he is painting, rather than serving as a detached observer. A triangular piece of sweet dough, lightly fried—Yemen’s answer to the doughnut. The clay or mud brick ovens used across Yemen for baking bread. شبشباً = Yemeni Arabic for slippers or flip-flops (usually inexpensive plastic or foam ones). I’ve chosen the latter translation since it retains the onomatopoeia of the original Arabic. Al-Ahdal explains that this ‘cellular disease’ is a metaphor for the widespread corruption that begins at the highest and most privileged levels of Yemeni society and trickles downwards, eventually affecting the entire citizenry. If we date the onset of ‘Abd al-Latif’s malady to 1994, as he does in the preceding paragraph, then his breaking point, seventeen years later, is 2011. Given that al-Ahdal’s play was composed and performed in 2009, its suggestion that the corruption that destabilizes ‘Abd al-Latif would culminate in violence and bloodshed by 2011, the year of Yemen’s ‘Arab Spring’ protests, seems eerily prophetic.